Groucho and Chico are stowaways hiding in the ship-captain’s cabin. Chico, in his broken Italian-American accent, is trying to be impressive with his sailing knowledge. Marx Brothers fans loved ridiculous lines like that. They may not have been overly funny, but their wackiness gained them fans over several generations. Let’s apply that Monkey Business theme to the creation–evolution issue. Many people would see the first dialogue as humorously ridiculous, but would dismiss the second as simplistic or even wrong. Yet one is as ridiculous as the other. The human-fossil record does not support evolution, and even some prominent evolutionists have admitted the problems—including David Pilbeam and Mary Leakey. Most people believe the fossil record does support evolution because they are told this by others who confuse wishful thinking with facts. This point has been brought out strongly in a new book by Marvin L. Lubenow—Bones of Contention: A Creationist Assessment of Human Fossils (Baker Book House, Grand Rapids, Michigan, 1992). 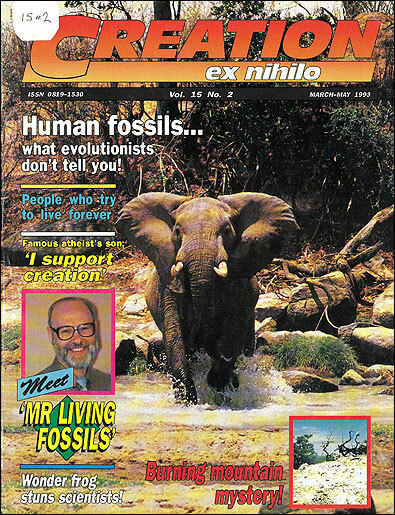 Lubenow’s 25 years of research into the human-fossil issue has shown that our alleged evolutionary ancestors seem to be on the run. It is impossible to track them down. Vital evidence for the evolutionary side has included fakes, mistakes, datings that shift to fit the theory better, and classifications that go against clear anatomical evidence. Lubenow says that evolutionists have done some extraordinary waving of magic wands to make evidence against their theory disappear. For example, he points out that a well-preserved arm-bone fossil found in 1965 at Kanapoi, north Kenya, was found to be indistinguishable from a modern human’s arm-bone. But because it was regarded as being from a time before humans had evolved, it was suggested that it must be from an ape. This went against all the scientific evidence. If the Kanapoi fossil had been given human status, as it obviously should have been, it would have contradicted the theory of human evolution—because it would show that humans had been around before their alleged ape-like ancestors had evolved into them! Problems leap out when you study the human-fossil record in evolutionary terms. For instance, most people who have heard of Neandertal man believe the Neandertal people fit somewhere in the evolutionary line leading up to modern humans. But where do they fit? Although they were a race of humans, evolutionists have no idea where Neandertals came from or went. The Neandertals’ ‘evolutionary’ origin is as mysterious as their alleged rapid disappearance. From a creationist point of view though, the Neandertals were simply a group of humans who lived in the past. When different ‘types’ of fossil humans which allegedly evolved one into the other (such as Homo erectus, Homo sapiens, etc.) are discovered at the same place and/or at the same level, it is regarded as an evolution ‘anomaly’. Such evidence is either lamely explained away or shelved and largely forgotten. But shouldn’t it alert evolutionists to the fact that their theory may be wrong? Marvin Lubenow has done a superb job in showing that the human-fossil record is contrary to the idea of human evolution and is strongly supportive of the idea of special creation. Both evolutionists and creationists would do well to study his assessment of the current state of human fossils.